GROTESQUE: The Shattering Horror Of Cinematic Incoherence – Schlockmania! 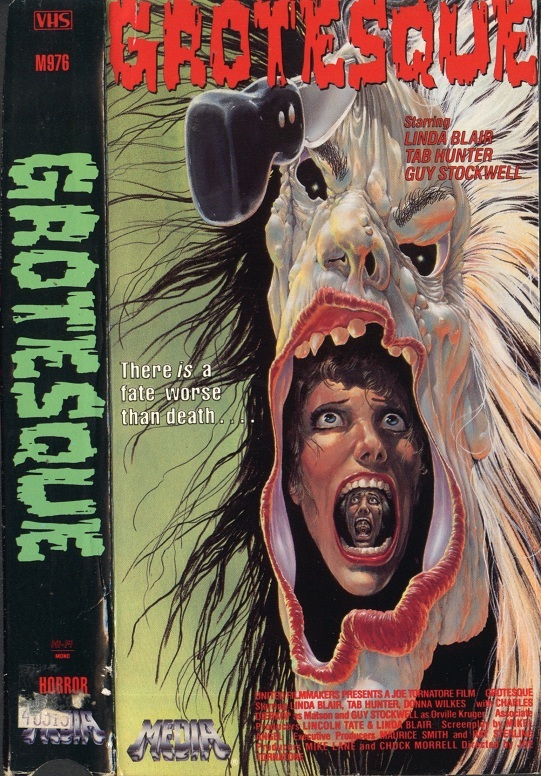 Grotesque was one of the many horror films dumped on home video during the late 1980’s. For this kind of fare, it was high profile. It was released on a major video label (Media), was advertised in the horror magazines of the era and has a decent roster of exploitation flick names: Linda Blair, Tab Hunter, Donna Wilkes and Guy Stockwell all pop up here. None of this makes Grotesque a good film – In fact, it’s pretty dreadful despite its basic technical competence- but it takes a very unique and convoluted path on the way to melting the viewer’s brain. The plot of Grotesque is a perplexing mix of horror, revenge movie and a twist-happy “family with dark secrets” premise. Blair toplines as Lisa, a young lady who takes her pal Kathy (Wilkes) home to the mountain cottage owned by her family. A group of cartoonish “punkers” threaten them on their way in but they make it home safely. Home is revealed to be a bit of kooky place because Lisa’s dad, Orville (Stockwell), is a makeup effects artist. There’s also an unseen patron of the house, Patrick (Bob Apiza), who is discussed but not seen. The punkers attack the home when night falls… and that is where Grotesque flips its wig. Without giving away too much, there are some crazy plot surprises here as well as the introduction of Hunter as Rod, the plastic surgeon brother of Orville. It literally becomes an entirely different film in its second half as it hurtles towards a genuinely wacked-out twist ending that is topped off by a second twist ending that reduces the proceedings to pure, gibbering incoherence. Sadly, Grotesque is not as fun as it is weird. It has a slow, talky and weirdly quaint feel to it, perhaps because it is the creation of a couple of 1970’s exploitation flick holdovers trying to take the 1980’s horror market by storm. The writer was Mikel Angel, who is best known to exploitation buffs for writing the similarly bizarre The Love Butcher, and what he comes up with here is a high-concept plot that makes no sense and is told in a clunky manner that never makes the most of its unusual elements. The director was Joe Tornatore, who made the oddball action/exploitation flick Zebra Force. While he can create competent t.v. level visuals, his direction of actors and ability to stage suspense or action is hopeless. As for the acting, Blair and Wilkes are pleasant but obviously on autopilot in these dire surroundings. Most everyone else is pretty lousy here, especially the “punker” villains. In fact, the punks here are amongst the least convincing in screen history, with Brad Wilson giving an operatically awful performance as the ridiculous leader, Scratch. Wilson shouts and grits his teeth in a way that suggests he was trying to bring the film down single- handed. The most entertaining bad performance comes from Hunter: without revealing too much, his final scenes here are unforgettable. The one other cast note worth mentioning is that Robert Z’Dar appears as a punk here, just a year before he would become the anti-hero of Maniac Cop. In short, Grotesque is never as entertaining as it should be given the cast and the crazy plotting but it’s weird enough for 1980’s horror completists to sit through once. It is probably best to watch it late at night, when its fractured logic will be less damaging to your psyche and you can write it off as a particularly trashy bad dream. Vampires, Mummies & Monsters Collection [4-Film Feature] In The Velvet Vampire, a couple accepts an invitation from the mysterious Diane LeFanu (Celeste Yarnall, The Mechanic) to visit her in her secluded desert estate. Unaware that Diane is actually a centuries-old vampire, the couple soon realize that they are both the objects of her seduction and cravings…When Baron Frankenstein is killed by his creation, his daughter Tania (Rosalba Neri, aka Sarah Bay) creates her own creature using the brilliant mind of her assistant and the body of her dimwitted servant in Lady Frankenstein. She not only ends up with the perfect lover, but one that can destroy her father’s killer. Also starring Joseph Cotten (The Third Man) as Baron Frankenstein.Lisa (Linda Blair, The Exorcist) was looking forward to a nice, relaxing vacation at the family cabin, but instead she bears witness to the brutal death of her friends and family at the hands of a group of mindless punks in Grotesque. As the thugs close in on Lisa, they don’t realize they are about to come face to face with something far more horrifying than themselves.From deep within the tomb of the Egyptian pharaoh Tutankhamun, Professor Douglas McCadden ships the coffin of Ankh-Vanharis to the California Institute of Sciences, where X-rays reveal five diamondlike crystals hidden within the coffin. Technician Peter Sharpe steals the crystals, but he doesn’t notice that the powerful X-ray has revived a green fungus. When the coffin is opened at a university press conference, the reporters uncover more than they bargained for. The mummy has disappeared . . . the Time Walker is alive again! 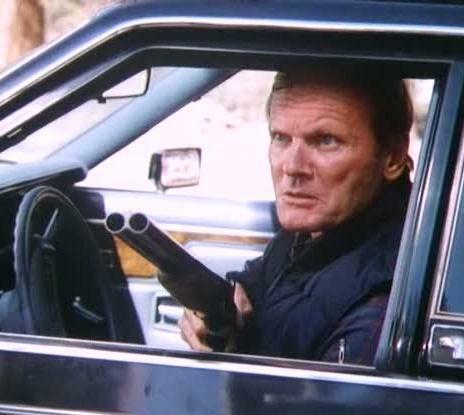 The film may be a complete celluloid mess,but at least Tab Hunter’s appearance(and role)as the uncle with a dark secret(and his vengeance that follows) helps make the film compelling(even if the film-within-a film comic finale basically near ruins it[a “twist” very finale shouldn’t have been made,since Hunter’s final wrath is a pretty much perfect ending that gives the films its strength over its many weakenesses]). Tab Hunter is delightful in this, particularly in the last five minutes. I used the image of him with the shotgun as the final image for this review in tribute to his above-the-call-of-duty theatrics.